When I was about 7 months pregnant with Marshall, my husband and I took a hike in the woods and up a very steep hill. I’m not exaggerating when I say it’s steep. It used to be a ski area. Maybe we were nuts to tackle it during my third trimester. Falling would have been very bad, and I could just imagine my gynecologist berating me for putting my baby at risk. But I was proud of the fact that I could still climb a hill, and I needed the exercise. I was as careful as I could be. The reason I mention this story is that near the top of the hill, there was a sunny area covered by flowering shrubs. The flowers were pretty and I wondered what they were. When I came home, I looked them up in my field guide to North American plants and decided that they had to be either blueberry or bearberry. 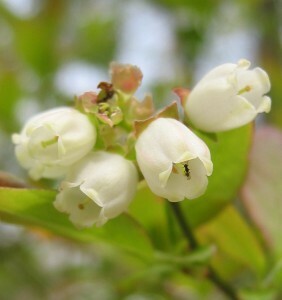 Later that year, I discovered a blueberry bush in my own yard. I was thrilled! Though I never got to eat any of the fruit (it was mostly gone before it was fully ripe), I knew the bush could act as a gauge, telling me when the local blueberries were ripe. As you can see from the pictures, my gauge plant is in bloom and getting itself pollinated. The fruit is on the way! This year, if I can find a big patch of blueberries, I might be able to pick enough wild blueberries to make blueberry pancakes. So I’m thinking about those bushes, not to mention some other promising areas of shrubbery up in the woods behind the house, and hoping. Wishing, wishing, wishing for wild blueberry pancakes! 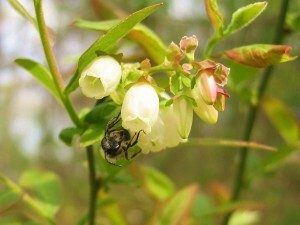 This entry was posted in Out and about and tagged blueberries, bugs, hiking, photos, plants, pregnancy, SITY. Bookmark the permalink.